Due to a growing demand in VoIP Public Address and especially IP based Loud Phone Ringers, we thought a guide detailing available products and most recent data sheets would be helpful for you. We provide IP enabled SIP endpoints for VoIP Networks. All products integrate with your end users IP-PBX (SIP Server). All products are directly certified & supported by around 37 IP Phone System Manufacturers. TWO PRODUCTS IN ONE: Each Certified SIP endpoint we provide features 2 x SIP Lines, this allows you to integrate the device to 2 x Phone Extensions on your network. This is especially useful if you want to use the device for Public Address Announcements & Loud Ringing. If Phone Extension one is called, you can make a live announcement, if phone extension two is called, an audio file can play. Alternatively, just use the Endpoint for either or. Remember: With each device, its not just for use with one phone, from the IP Phone System, you can join many extensions into a hunt group. Therefore, each below device can ring for multiple IP Phones. The office ringer is the least loudest but it still has its place. 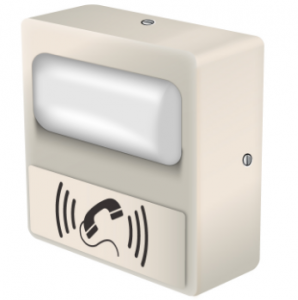 You can extend the reach of a phones ring, you can group multiple IP Phones together, its easy to install, lowest price and you can connect the Strobe Kit. 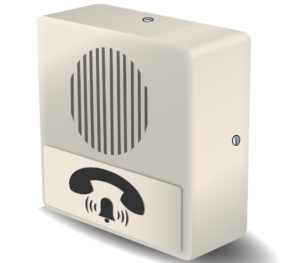 The SIP Ceiling Speaker is predominantly used as a Public Address Endpoint. However, it can also be used for Loud Phone Call Notification. Its primary sip extension can be used for Loud Ringing or use the Primary for direct calling and use SIP extension 2 for Loud Ringing. One of our most popular devices. An internal and external VoIP Tannoy System. This is the loudest SIP endpoint device in the range. Each AMP can drive a max of 2 x 40 Watt Bull Horns. The AMP connects on a data cable and Power Over Ethernet. That POE supply powers the 40 Watt Loudspeakers. Just for Loud Phone Ringing, this option could be over budget. 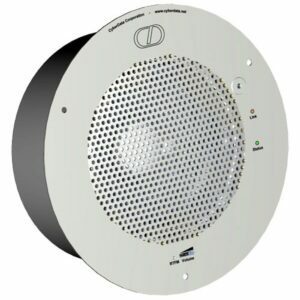 However, it can also be used as a Public Address Loudspeaker, set to auto answer and make direct calls/announcements. The AMP can play background music through mp3. The on-board relay can also wire up to door and window sensors. 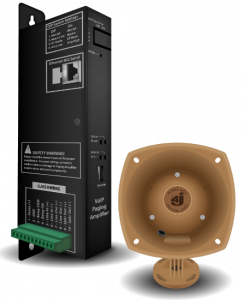 The Auxiliary Strobe Kit comes with a 1-meter cable that enables the user to connect to the SIP Speaker, Amplifier or Office Ringer. Power and signalling for the strobe comes from the SIP Endpoint. Setup of the strobe’s blink rates and brightness are through the web interface of the attached IP endpoint. Different Strobe colours, blink rate and brightness can be tied to multiple activation scenes. Also features Mailbox Message Waiting Indication. 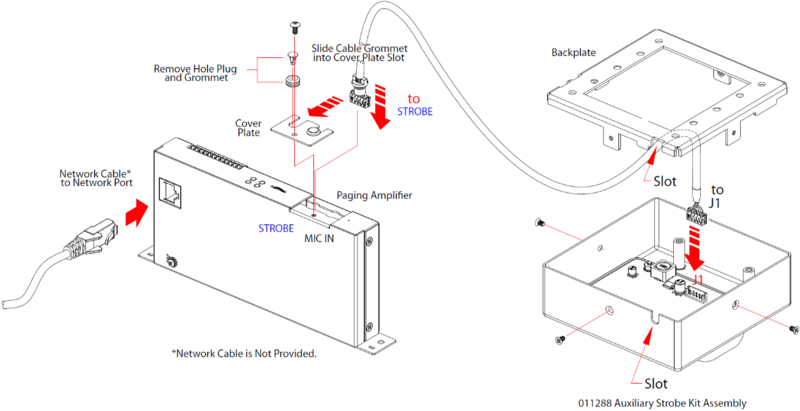 Below Shows the Visual Strobe attaching to the VoIP Amplifier – No separate power needed. Each device sets up just like a telephone. Ask the end user to set up a new extension on the network, similar to if a new member of staff was starting. Using our SIP devices web-page, register it to that extension. The hardware connection is Cat5e/Cat6 and POE. Fast and easy set up. We are UK based & our product is made in California. We can ship around globe but our main customer base is in the UK. We hold the SIP entry phones in stock as these are more fast moving. 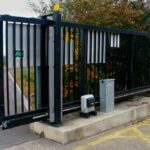 Public Address endpoints are usually more project specific, so we order in to the demand. UK Customers: Around 5 days into us, then next day UPS to you. EU Customers: Around 5 days into us, then 2 days UPS to you. USA Customers, Ground or Air Ship, 2 – 5 days UPS.